The Witch Head Nebula, also known by its official name, IC 2118, is a very faint reflection nebula in the constellation Eridanus. It was nicknamed the Witch Head because it looks like a profile of a wicked witch. The nebula is illuminated by the bright star Rigel in Orion. 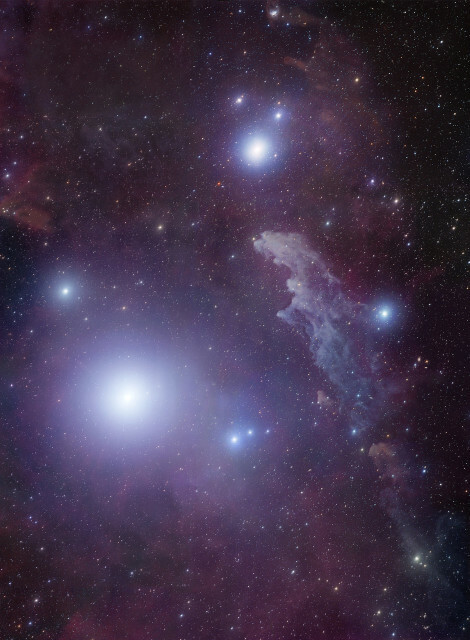 It lies at a distance of 1,000 light years from Earth and has an apparent magnitude of 13. Its designation in the New General Catalogue is NGC 1909. The Witch Head Nebula is an ancient supernova remnant or a gas cloud illuminated by the nearby blue supergiant Rigel, Beta Orionis, the brightest star in Orion constellation and the seventh brightest star in the sky. The nebula can be found to the upper right of the star, but it is not visible to the naked eye. Reflection nebulae reflect light from just one or several nearby stars. 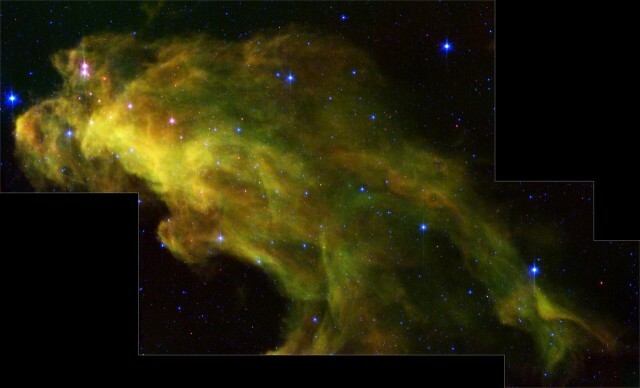 If the stars responsible for illuminating the dust clouds are hot enough, they ionize the gas, creating emission nebulae. This isn’t the case with IC 2118, as the nebula merely reflects Rigel’s light. IC 2118 is located 2.6 degrees to the west of Rigel. The star is approximately 860 light years distant from Earth and about 40 astronomical units away from the Witch Head Nebula. Rigel has an absolute magnitude of -7.92 and a luminosity about 120,000 times that of the Sun, which is how it is able to illuminate clouds lying at a distance 40 times that between the Earth and the Sun. Radio observations of the nebula have revealed that parts of IC 2118 show significant carbon monoxide emission. This indicates that the nebula contains molecular clouds where star forming activity occurs. Astronomers have detected candidates for pre-main sequence stars, very young stars just beginning their lives, as well as some T Tauri stars embedded deep within the nebula. T Tauri variables are pre-main sequence stars with a mass less than two times that of the Sun, yet more luminous than main sequence stars with the same mass because they have larger radii. These stars are usually found near molecular clouds. The molecular clouds of the Witch Head Nebula are believed to be associated with the massive stars belonging to the Orion OB1 association and juxtaposed to the outer edge of the Orion-Eridanus bubble. The Orion-Eridanus bubble is an enormous supershell of molecular hydrogen blown by members of the Orion OB1 group. The supershell is gradually expanding, creating favourable conditions for starburst activity. The Witch Head Nebula lies in one such region. The nebula’s relationship with the Orion OB1 association is supported by the fact that its comet-shaped clouds point in the direction of the association to the northeast. 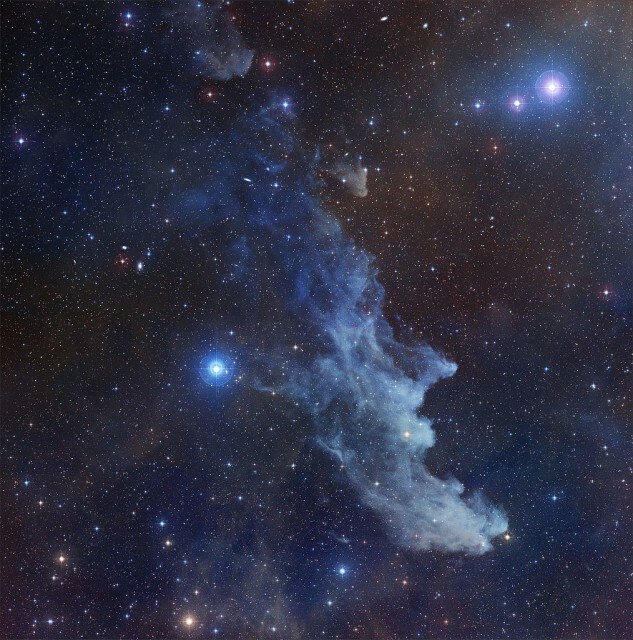 The blue colour of the Witch Head Nebula is in part a result of the dust particles within the nebula reflecting blue light more efficiently than red. A similar process is responsible for making our sky appear blue. 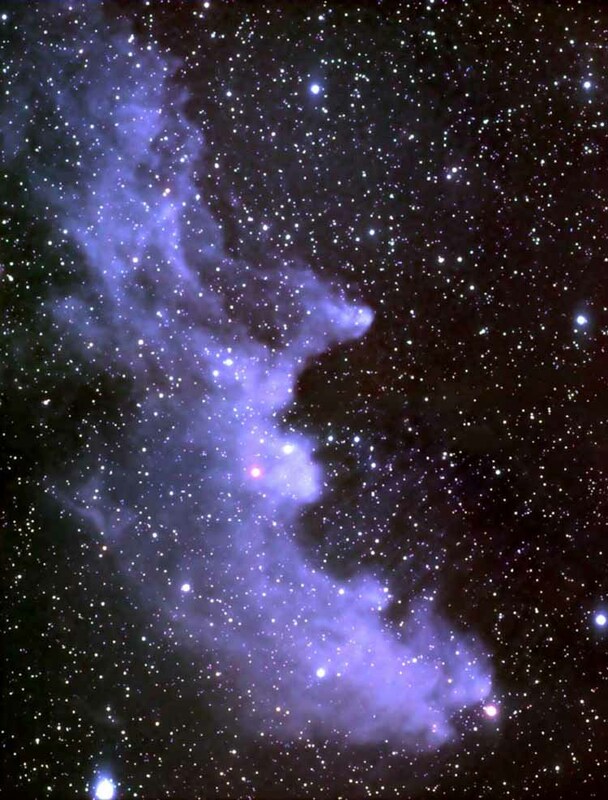 The Witch Head Nebula was discovered photographically by the German astronomer Max Wolf in 1909. The nebula was memorably used in the television series Andromeda as the site of a major space battle that sent civilization into an era of chaos. The nebula is about 50 light years long. Observations in infrared wavelengths led astronomers to discover a half dozen new stars within the nebula. The Witch Head Nebula emits in infrared because its newly formed stars heat the surrounding gas and dust. The stars can’t be seen in visible light because the light is absorbed by the dust. One of these newly discovered stars is believed to have an orbiting disk of dust and gas in which planets may be in the process of forming.